Take Your Customers Up, Up and Away! Our mission: One day, 20 hydro poles! We Work Here, We Give Here! Our vision of the Chaudière Falls expansion project is three-fold: produce clean, renewable energy in an environmentally responsible way; be an open public space to be enjoyed by all; and serve as a place of recognition and celebration of Canada’s First Nations and Ottawa’s industrialist past. 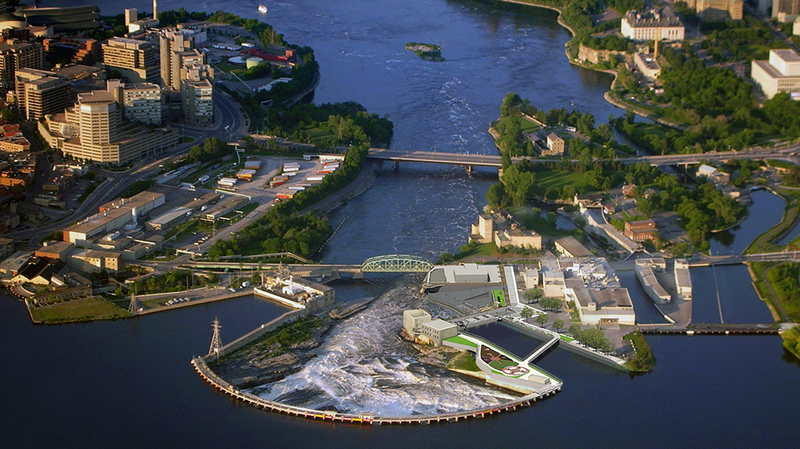 The expansion project will change the way people access and experience Chaudière Falls. Built entirely below ground, the project is designed to have minimal-to-zero impacts on the visual, natural and aquatic environments. To ensure safe fish passage through our facility we’ve incorporated leading technological solutions to protect migrating American eel, endangered under the Ontario Endangered Species Act (ESA), and facilitate their upstream migration past the numerous hydro-electric facilities at Chaudière. In addition, there are new spawning beds being built downstream to promote the recovery efforts associated with sturgeon (also endangered under the ESA). Using your mouse, move the slider for a glimpse of what our site will look like once complete. Our new below-grade 29-megawatt hydroelectric facility will feed into the provincial grid and power 20,000 homes with clean, renewable energy; reducing greenhouse gas emissions by 115,000 metric tons of CO2 every year. 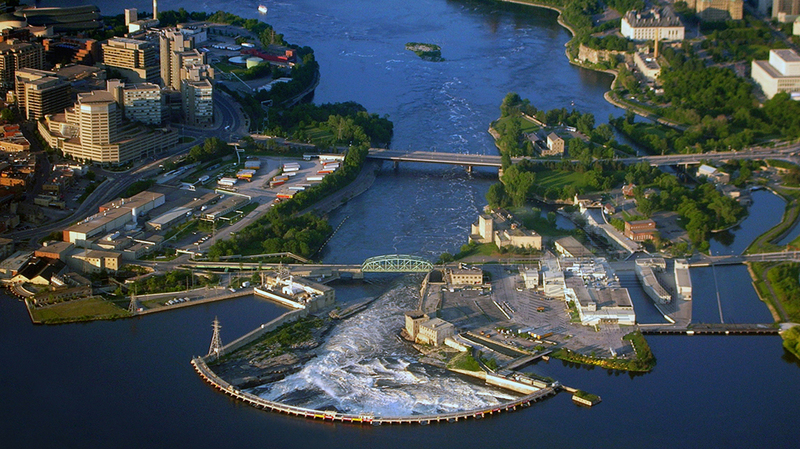 Chaudière is home to Canada’s oldest hydroelectric station still in operation. Chaudière was responsible for lighting Ottawa’s streets with electricity and fueled the industrial explosion of the mid-1800s by providing water power for the vast complex of lumber mills that once occupied the shoreline of the Ottawa River. The new site will offer safe viewing platforms and greater public access in the form of a defined corridor on the roof of the new below-grade hydro facility. A new bridge across the intake canal will be open for pedestrian and cyclist traffic. Using a restorative philosophy, we are maintaining elements of the city’s industrialist past, including refurbishing two of the site’s oldest buildings that survived the Great Fire of 1900. For the first time in more than 100 years, Chaudière Falls will be open to the public to enjoy. Day in and day out, you can watch history being made by following the progress of our Chaudière project with our on-site webcam. Stories and features on what’s happening at Hydro Ottawa, in our industry and in our community.